Going in to Monsters I had high hopes. Gareth Edwards special effects work had been highly praised, on a budget reportedly under $1 million, and the film itself had received rather praiseworthy reviews. Unfortunately, it was a case of the final product not being able to live up to my expectations. After a probe crash lands in Mexico strange extraterrestrial creatures begin appearing in the region near the crash site. The US and Mexican governments create an infected zone around the area and wage an endless battle to contain the creatures. Stuck in the middle of this are Andrew Kaulder (Scoot McNairy) a struggling photographer looking for a money shot of the creatures and Samantha Wynden (Whitney Able) who, for some reason, happens to be in Mexico. Sam is also the daughter of a powerful publisher, who happens to be Andrew’s boss, and Andrew is blackmailed in to bringing Sam back to the US safe and sound so she can marry her fiancé. The two set out on a perilous journey through the infected zone. Monsters starts off well. In a scene remiscent of Cloverfield and District 9 a group of soldiers, transporting some civilians, come in contact with one of the creatures. Shot through night vision a fierce battle ensues. The scene immediately grabs your attention and has you thinking ‘sweet a movie about monsters’. The thing is Monsters isn’t really about the monsters. At its heart Monsters is a dramatic road movie where the journey is more important than the destination. There is also a bit of forbidden romance thrown in between the engaged Sam and the father of a child to another woman Andrew. It ended up being nearly everything but an alien invasion, monster romp with balls to the wall action, heroics and a whole bunch of other clichés. The thing is everything I had seen or heard about Monsters prepped me for a monster flick, even the beginning. My expectations were so geared towards something completely different that I couldn’t enjoy the other aspects of the film. Throughout the movie you expect something to happen, even right up to the end, but nothing really does and you end up feeling a little cheated. The monsters themselves were okay. Given the budget they are well integrated into the scenes, never standing out as obviously CGI same with the military equipment it all looks very good, but the designs are a little uninspiring. The monsters are basically giant squids walking around making whale noises. I thought we might have been treated to a few different designs, but there was just the one type of creature. The two leads are both relative unknowns. As the monsters are not really the focus of the film a lot of the onus is on them to really sell it. In the end there performances were kind of bland. There was nothing spectacular about them and the romance is nothing we haven’t seen in countless indie dramas, the only difference was the setting. In Blu-ray hi-def the film looks good. The picture quality is of a high level throughout with no visible flaws in the footage. The jungles of Mexico look quite amazing and ‘The Wall’ looks as imposing and ominous as it is made out to be. Aesthetically Monsters is certainly a very pleasing film, the camera wandering and gliding over the scenery. The sound was a little disappointing mainly because not much happens. Sure your surround sound and sub gets a bit of a workout whenever a few jets fly over head and the strange noises of the infected zone created a tense atmosphere, Edwards certainly knows suspense, but it’s not a film that really puts your system through its paces as there really aren’t that many action scenes. The film has a nice set of special features with a Q & A at the Melbourne premier the highlight. 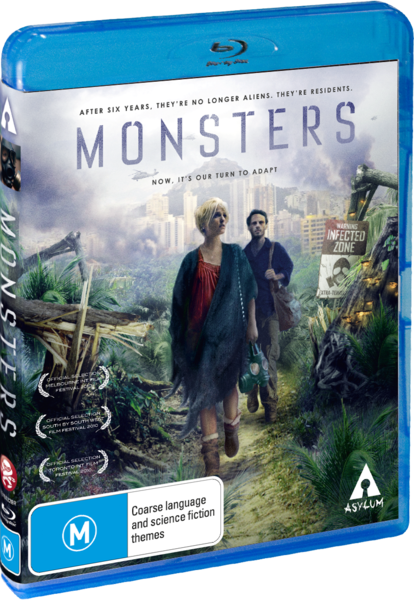 Overall, Monsters isn’t a particularly bad film especially on Blu-ray. It looks good, but it was just hard to get past the unfulfilled expectations. Edwards clearly has talent and a future in the industry, but for me Monsters just didn’t do it.